A total of 23 tornadoes were sighted across the South on Wednesday (some sightings were likely of the same twister), while the National Weather Service received dozens of reports of thunderstorm wind damage. Deadly tornadoes and damaging thunderstorms tearing across the South took at least lives. The severe weather outbreak commenced before sunrise, one of the worst times of the day since most people are sleeping and may miss vital warnings. By daybreak, seven tornadoes had been sighted across eastern Louisiana and southern Mississippi. Fortunately, these tornadoes did not claim any lives, but there was no shortage of damage and injuries. Fifteen people were injured when an EF-2 tornado included Shady Grove, Miss., in its 12-mile path of destruction. Nearly all of the injuries were relatively minor. The tornado completely destroyed several mobile homes, snapped numerous power poles and caused extensive tree damage. Several frame and brick homes also sustained major damage. Another EF-2 was only on the ground for 1.5 miles Wednesday morning but still had enough time to destroy a home and injure an occupant in the Whitfield, Ala., area. Seven other homes and five outbuildings were also damaged. Whitfield in located roughly halfway between Montgomery, Ala., and Jackson, Miss. 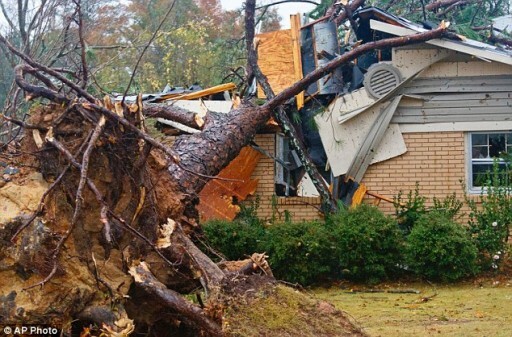 An unconfirmed tornado traveled 27 miles through east-central Alabama, causing significant damage in Auburn and Opelika. National Weather Service officials told the Associated Press that the tornado will likely receive the ranking of a high EF-1 or a very low EF-2, but storm survey crews must first view the damage today.